Before doing the Cumbria Way, it was the summer of 2000 when I’d last spent any substantial time in Cumbria. We did pop up for a wedding last year however long standing arrangements meant we had to be back in London the next day meaning we spent less than 24 hours in Windermere. However in 2000 we had a proper holiday there. A year after leaving uni, my finances were slowly but surely getting there, however there was still not enough in the bank to really pay for a proper holiday. So when my mum offered to lend us her car and camping gear, we snapped up the offer. We’d done the same the year before and had had a lovely time touring Wales where the weather had been stunning. We booked off some leave, got train tickets to Manchester so we could pick up the car, and started planning a trip to the Lakes. In the lakes we pitched up in a couple of different locations and at one point we’d stayed near Dungeon Ghyll, which the Cumbria Way goes through. 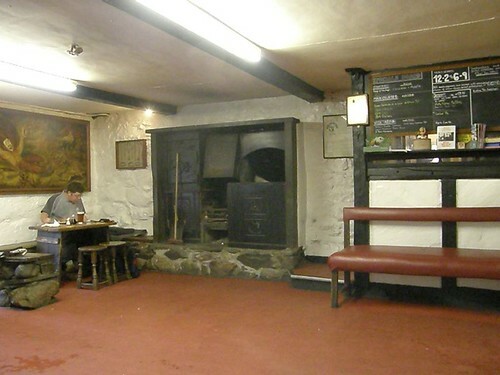 We’d been told by Catherine’s dad – who is like a walking encyclopedia of famous walkers pubs – that we had to pop into one of the pubs in the area – the Old Dungeon Ghyll. My overriding memory at the time was of a busy bar, surly staff, the absolutely worst smelling pub toilets I have ever been in in all my life, and the formation of a now strongly held conviction that no pub should ever, ever have fluorescent strip lighting. Photograph by Fred Jackson. Creative Commons licensed. So it was with a bit of trepidation that I found myself outside the pub nine years later. It was mid afternoon and a gloriously sunny day as I stepped over the threshold into the empty bar, with a notable absence of any staff. It took me some time to discover the rather hidden bell push on a pillar, but once that was done I managed to get my pint of Jennings Cumberland Ale. It was an excellent pint and one of five I could have chosen (unless I’d gone for a real cider anyway) pleasantly served by a very friendly chatty bar man who proclaimed it was the best weather the area had had in months. Adjourning to the beer garden, I supped on and even took the brave decision to check out the toilets. A boy of around of eight had already returned to beer garden proclaiming “they’re the worst smelling loos ever!” however he clearly hadn’t smelt anything. They’d clearly had a bit of a clean recently, and there was an automatic air freshener unit on the wall. Okay they weren’t great but they didn’t make your nostrils want to instantly close like they did for me nine years ago. On such a lovely day, my pint was gone far too quickly – the best pint in the world is always the one straight after a good walk – so I went back in, pressed the bell, and got a pint of my old student tipple. Ah, the ever lovely and delicious Theakston XB. There’s a part of me that desires to move to Yorkshire just so I can drink more of it. As I supped, I enjoyed a sight that was also absent nine years ago, as a large group of sparrows flew around the now empty beer garden, fluttering in front of me and occasionally landing on my table and looking at me until a young Austrian asked me if I knew where the “booooose stap” was – after initially thinking she wanted to know the secret of ordering a pint, it eventually dawned on me that she was after the bus stop. 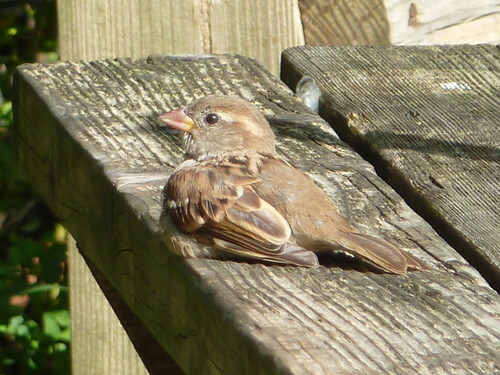 I could have stayed in the garden watching the birds fly and swoop around for hours – always returning to a bus near the pub door, but alas I too had to find the “booooose stap”. I was staying in Elterwater, and the last bus of the day was at 16:15. With regret I had to say goodbye and go down to the main road, where I got to enjoy some comedy mis-spelling on a sign for the pub which offered “Food & accommodation” – above which someone had thoughtfully stuck a bright yellow piece of plastic with an M on it. For some reason a Christmas tree motif was also included although why this was there in August is anyone’s guess. 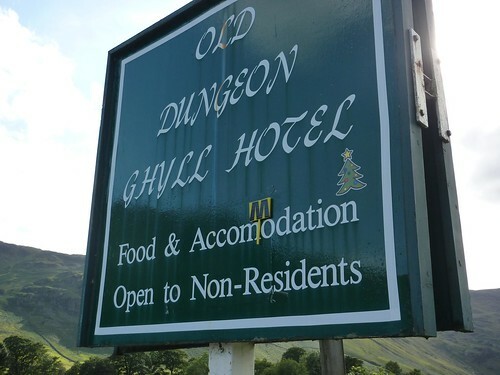 Mind you the sign wouldn’t be there for too much longer – as I arrived back at Dungeon Ghyll the next morning it was being removed and a new one set in its place. But that would be the next day. Today it was time to leave. I’d arrived at the pub not really wanting to visit. And left wanting to go back as soon as possible. Although it really would be nice if they got rid of the fluorescent lights and made the toilets smell just a bit better…. First Published: 13 October 2009. Last Updated: 27 August 2015.